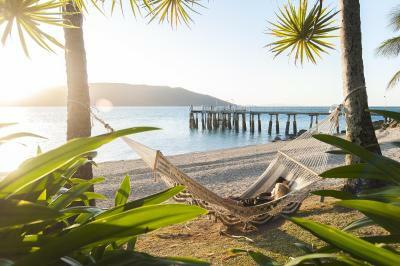 The refurbished Daydream Island Resort is located in the heart of Queensland's Whitsunday Islands. 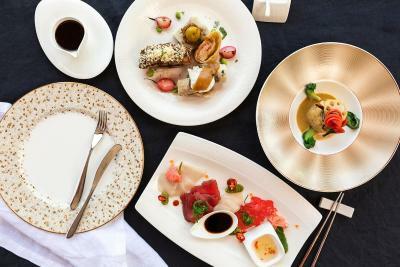 The stylish and tranquil retreat offers modern rooms and suites with free WiFi and a full buffet breakfast. The resort features an open-air cinema, outdoor pools and three bars and restaurants. All accommodations provides spacious rooms with a modern living area, air conditioning and a flat-screen TV with free in-house movies. 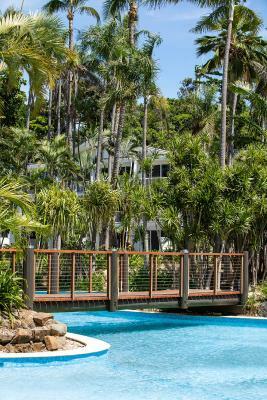 Most feature a private balcony or terrace with views of the ocean, marina or tropical gardens. Interconnecting rooms for families and accessible rooms are available. 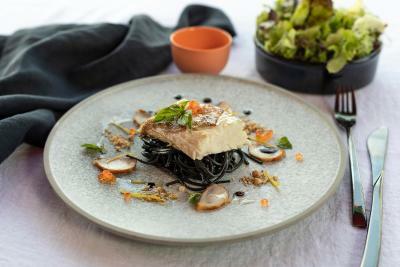 You can choose from a choice of restaurants at the resort including Graze, Inkstone Kitchen & Bar and an Asian Fusion restaurant. 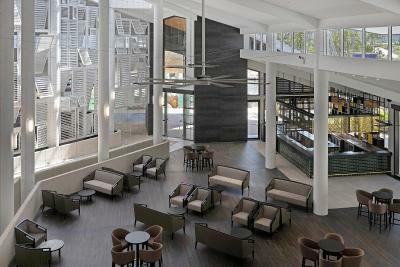 Guests can take a stroll through Daydream's rainforest walk or work out in the fitness center. The property also features over 20 free on-island activities including kayaking, stand up paddle boarding and a public fish feeding show. 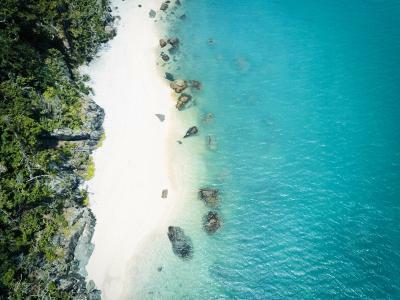 The tour desk can book a Living Reef Guided Snorkel, meet and feed Barry the Shovelnose Ray or experience what it’s like to be a Marine Biologist for a day, as well as Whitsunday and Great Barrier Reef day tours. Staff are able to converse in English and some in Chinese. 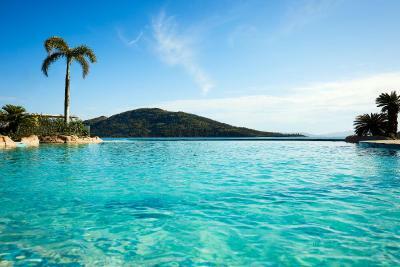 When would you like to stay at Daydream Island Resort? This air-conditioned room features 2 queen-size beds with views out to the resort through windows that offer an abundance of natural light, a shower over the bath and eco-friendly amenities. Also included is complimentary WiFi, a flat-screen TV, mini-bar and tea/coffee making facilities and are conveniently located close to the central Atrium building. Please note the maximum capacity of this room type is 4 people and 1 infant. This air-conditioned room features 1 King-size bed with views out to the resort through windows that offer an abundance of natural light, a shower over the bath and eco-friendly amenities. Also included is complimentary WiFi, a flat-screen TV, mini-bar and tea/coffee making facilities and are conveniently located close to the central Atrium building. This air-conditioned room features 1 king-size bed with sliding doors that open onto a balcony with direct pool views. 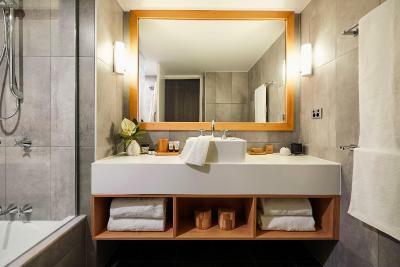 A shower over the bath, eco-friendly amenities, complimentary WiFi, a flat-screen TV, mini-bar and tea/coffee making facilities are also included. Please note the balcony may vary in size. This air-conditioned room features 2 queen-size bed with sliding doors that open onto a balcony with direct pool views. A shower over the bath, eco-friendly amenities, complimentary WiFi, a flat-screen TV, mini-bar and tea/coffee making facilities are included. This air-conditioned room features 1 king-size bed with sliding doors that open onto a balcony with poolside and garden views. A shower over the bath, eco-friendly amenities, complimentary WiFi, a flat-screen TV, mini-bar and tea/coffee making facilities are included. This air-conditioned room features 2 queen-size beds with sliding doors that open onto a balcony with poolside and garden views. A shower over the bath, eco-friendly amenities, complimentary WiFi, a flat-screen TV, mini-bar and tea/coffee making facilities are included. This air-conditioned room features 1 king-size bed with sliding doors that open onto a balcony with ocean views. A shower over the bath, eco-friendly amenities, complimentary WiFi, a flat-screen TV, mini-bar and tea/coffee making facilities are included. This air-conditioned room features 2 queen-size beds with sliding doors that open onto a balcony with ocean views. A shower over the bath, eco-friendly amenities, complimentary WiFi, a flat-screen TV, mini-bar and tea/coffee making facilities are included. 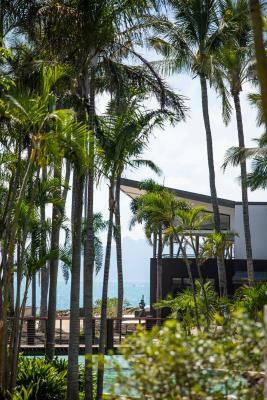 Facing directly out over the ocean towards the Whitsunday Islands, these rooms are located on the eastern side on the ground, first and second levels. This air-conditioned room features a large terrace with outdoor furniture, a walk-in shower, eco-friendly amenities, complimentary WiFi, a flat-screen TV, mini-bar and tea/coffee making facilities. Please note that the maximum occupancy is 2 people and 1 infant in this room. This luxury, air-conditioned room features 2 queen-size beds, a sitting area and generous balcony to take in the magnificent island views. A walk-in shower and a bath with eco-friendly amenities is provided as well as complimentary WiFi, a flat-screen TV, mini-bar and tea/coffee making facilities. Please note that the maximum occupancy is 4 people and 1 infant in this room. 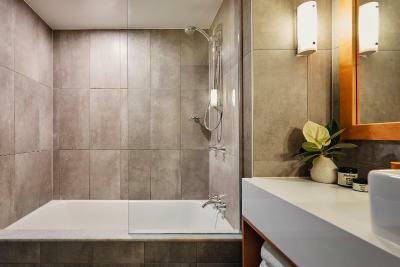 This suite features views of Lovers Cove, which can be enjoyed from every aspect, including the en-suite that features a spa bath and eco-friendly amenities. The suite also includes complimentary WiFi, a flat-screen TV, mini-bar and tea/coffee making facilities as well as a luxurious king-sized bed, a separate living area and generous balcony. These disability access rooms provide a wider entry door, easy access shower (without bath) and a lower set vanity. This air-conditioned room features views out to the resort through windows that offer an abundance of natural light and eco-friendly amenities. Also included is complimentary WiFi, a flat-screen TV, mini-bar and tea/coffee making facilities and are conveniently located close to the central Atrium building. The rooms are available with a King or King-split bedding. These disability access rooms provide a wider entry door, easy access shower (without bath) and a lower set vanity. 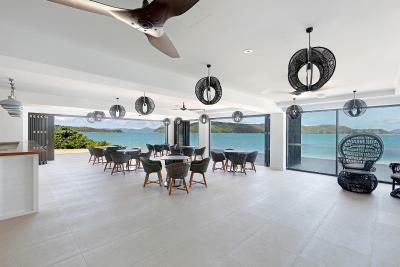 Facing directly out over the ocean towards the Whitsunday Islands, these rooms are located on the eastern side on the ground, first and second levels. This air-conditioned room features a large terrace with outdoor furniture, eco-friendly amenities, complimentary WiFi, a flat-screen TV, mini-bar and tea/coffee making facilities. 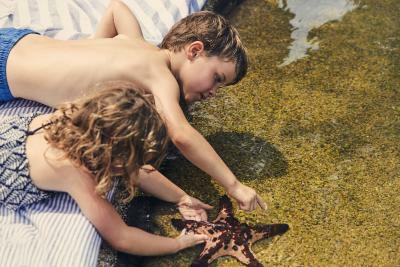 House Rules Daydream Island Resort takes special requests – add in the next step! Debit card Daydream Island Resort accepts these cards and reserves the right to temporarily hold an amount prior to arrival. 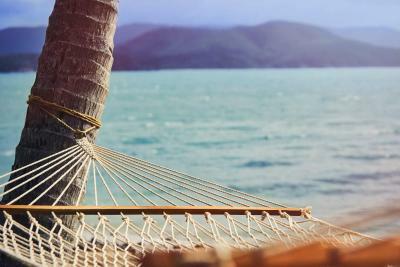 Daydream Island Resort accepts these cards and reserves the right to temporarily hold an amount prior to arrival. 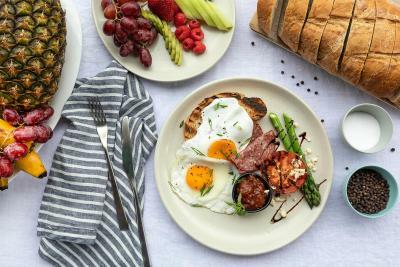 Please note that a nonrefundable 3.36% charge applies for payments made with American Express and Diners Club credit cards, and a 1.25% nonrefundable charge applies for payments made with Visa and Mastercard credit cards. 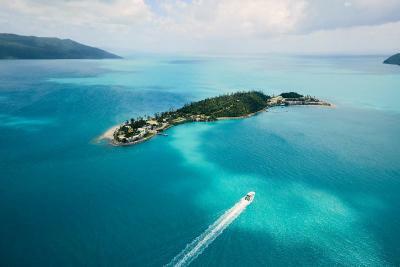 Daydream Island Resort and Spa is accessible via ferry from Great Barrier Reef Airport (HTI), Whitsunday Coast Airport (PPP) or Airlie Beach. 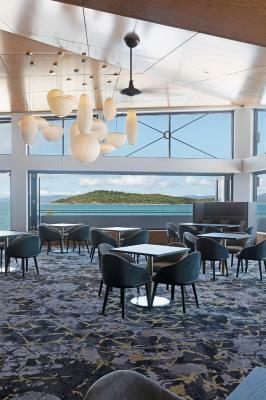 Daydream Island Reservations can assist with booking ferry transfers after you have made your reservation. Please use the contact details provided in your confirmation. 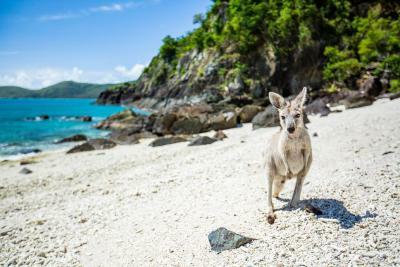 Please inform Daydream Island Resort of your expected arrival time in advance. You can use the Special Requests box when booking, or contact the property directly using the contact details in your confirmation. We need at least 5 reviews before we can calculate a review score. 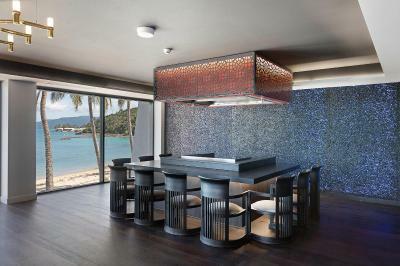 If you book and review your stay, you can help Daydream Island Resort meet this goal.